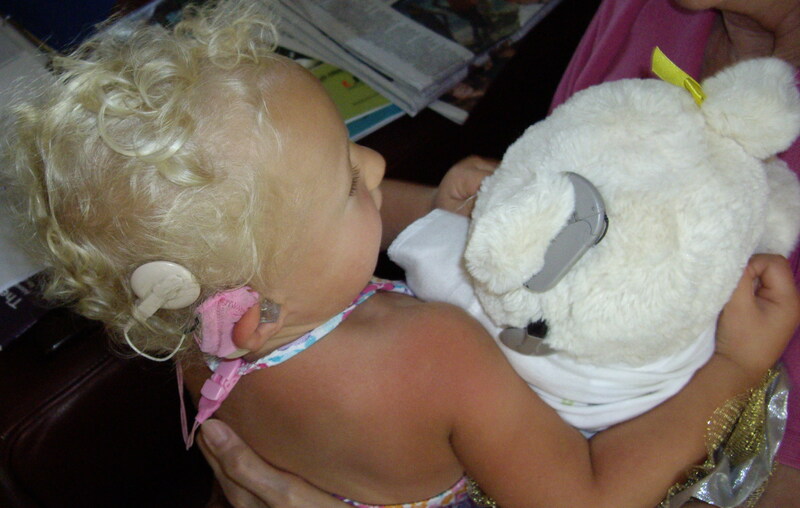 Young Kiersta was 16 months old when she received a cochlear implant called the Med EL Opus 2. Currently, Kiersta is enjoying a two-week visit with Christi Bearowitz’s left cochlear implant as part of the Traveling Awareness Bears Family. Kiersta’s mom, Alex, sent me this photo of her young daughter and bear friend for the Show Me Your Ears Campaign. What an adorable pair they make! The Traveling Awareness Bears mission is to spread awareness about different (dis)abilities, disorders and syndromes, and to help children feel comfortable with their unique abilities. The project began in 2010 with one bear, one boy, and a desire to raise awareness about pediatric stroke. There are now several bears reaching children with a wide variety of diagnoses. Visit the Traveling Awareness Bears website for more information. Thanks, Kiersta and bear friend, for taking the time to show off beautiful ears! Have you sent your ear photo to Lipreading Mom? No? Show Me Your Ears today. « How Did a Mouse Get Trapped in My Ears?